I had a really bad habit of overthinking which kept my mind occupied with all these thoughts related to things I could have done or said. I used to keep worrying about something that is in already the past. I used to ruin my own mood for something that wasn’t even in my control anymore. The what-ifs, only ifs, make us worry about things that aren't even relevant in the present moment. They drag us back to the past, and we end up being stuck in the “what could have been” thought cage. Time passes quickly, and everything changes faster than you can imagine. And although you will get rid of this feeling of uneasiness eventually, it’s essential that you don’t waste your time now and make the right choices. 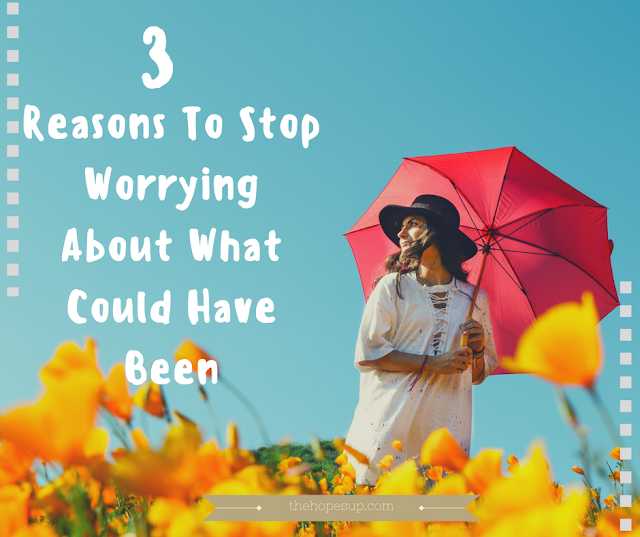 Below is a list of 3 things you should keep in mind whenever you find yourself worrying about what could have been. 1. Not everything is in your control. Even if you had gone another way of doing things, you could never guarantee that everything would have turned out exactly the way you wanted. There are so many uncontrollable factors that affect your life every day. And you can’t always assure that things will happen exactly according to your plan. Well, whatever it was, it didn’t happen, and it’s over. There’s no point in thinking about it. So instead of worrying about the stuff that didn’t happen, focus on the present. Don’t let these thoughts get to your peace of mind. Focus on the things you can change or improve now. Be mindful of the present moment and the decisions you take now so that you don’t have to worry about it tomorrow. At least when you are completely sure of your actions and the decisions you are taking now, you will be sure that you have done the right thing. 2. Worrying makes you anxious for no good reason. Constantly thinking about what could have been kept me from getting a good sleep. I would keep replaying the same memories again and again and unnecessarily put myself under scrutiny for not acting or speaking in a particular way. Doing this over and over again led me to undermine myself and it was a seriously self-sabotaging habit. And that’s why you need to stop doing it, it’s completely pointless. If one opportunity is lost, believe that many more will come your way. And if you keep worrying about the lost ones, you won’t be able to see the opportunities ahead of you. You can go on continuously thinking about how different things would have turned out, but all of that thinking isn’t going to change anything now. 3. You don’t have a time machine. I find the concept of a time machine is quite fascinating. The idea of being able to manipulate time and changing your past decisions or witnessing your future life sounds like a lot of fun. I’m sure there are a lot of moments in your life when you wish you could go back and act differently which probably would have produced a different outcome. But sadly, (or not?) we don’t have one yet. We can’t go back and change our decisions or fast forward through all the problems in our lives. The only time you need to think about is now. Stop thinking about what could have happened and move ahead. Save all your worries for the day when you do have a time machine and then you can go back in time and do things differently. Until then, focus on the present and keep yourself in a happy state of mind- free of any unwanted, negative, anxiety causing thoughts. Do you ever find yourself thinking about what could have been if you acted differently or said something else in a particular situation? How do you deal with it? Share with me in the comments below. I'd love to hear about your stories. Love this post Jag! I often worry about things that are out of my control and it can cause serious anxiety. I hate it but it still happens! So I appreciate your words on this - it's been a useful reminder for me. Thank you!